Some while ago, while thinking of a quick and easy way to demonstrate the power of acceptance criteria, I devised this small activity that explains the concept. The activity is interactive and takes about 20 minutes to complete, including the discussion. All you need are some pens and paper and, for a little more dramatic effect, a flip chart — but that is not essential. If you want to explain acceptance criteria, then this activity gets across the concept very well in a simple, straightforward, and powerful way. I have run this activity in the U.K. numerous times, as well as in Switzerland, and it has worked in both locations successfully. Let me explain how to run the activity. If you want to simply yet powerfully demonstrate acceptance criteria, try it out for yourself. First, let me start with some background. When I was at school, all of my classmates were always sketching outline drawings of houses on paper or in their exercise books. 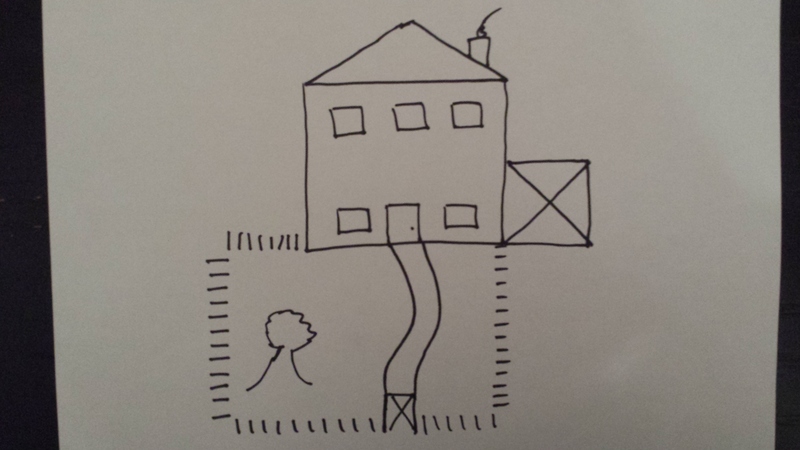 So I decided to use a simple house drawing to explain the concept of acceptance criteria. In the U.K., most houses are of a similar style, and I expect that the style I draw is one you can use in many locations. If you don’t feel this style will work for you, however, feel free to alter your house to a sketch of one that will work in your location. While they are doing this, draw your own house on a piece of paper or a flip chart sheet, making sure that no one else can see it. When everyone has finished, walk around and see what they have drawn. No one will have drawn what you have done, so as you go around say things such as, “Nice house — but not what I wanted,” or “How very artistic — but unfortunately not the house that I wanted.” You can make this very lighthearted, but essentially reject all of the houses as not being the house you were looking for. There is a door on the lower floor in the middle of the house. On each side of the door there is a window. On the upper floor, there are three windows evenly spaced across the house. The house has a pitched roof. The house has a garage. The house has a fence around a garden. The fence has a gate. There is a path from the door of the house to the gate. The garden has a tree. Now ask your group to draw the house again. When they have finished, turn around your flip chart (I find the flip chart works well and there is an element of a magic trick when you turn it around and reveal your house), and then ask them whether their house looks like yours. You will find that they will all have drawn a house that’s very similar, and in some instances it will be almost exactly the same. Now you can go around the room and check the houses and, where they have met your acceptance criteria, you can say, “Yes, I can accept that house; that is what I wanted.” If someone has missed something, you can reject it and explain why. If people have drawn what you wanted but added to it, then discuss this as gold-plating of your requirement. We can now debrief on the activity. Explain that through using a set of ten specific bullet points and statements, I got exactly what I wanted. 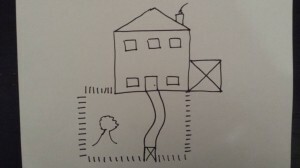 Ask whether you told them how to draw the house. The answer is no, so again restate, “I even got what I wanted without telling you how to do it.” You may find some people draw the tree or garage or chimney on the opposite side to you, so explain that you don’t actually care; in this instance what’s important is that you have them — it’s not important exactly where they are. You can also go on to explain that when using acceptance criteria with user stories and in the context of software development, you can use tools to automate these acceptance criteria as tests. Therefore you build up an automated regression test pack that will tell you whenever you deviate from the requirements. State the fact that the acceptance criteria are your requirements, and they just happen to be requirements that you can use to test your software and then to automate your tests. You can now explain how you used the acceptance criteria to verify that you got what you wanted. You can now make the point that not only are acceptance criteria your requirements that can be used for tests, and not only can they control the scope of your story, but they can also control the behavior that you expect to see (such as whether the garage should be to the right of the house). Finally, you can ask the group the general question about how they feel about this. Do they find it powerful? Most people are amazed and surprised by the simplicity and the power of acceptance criteria. So that is how I run the activity. I have run this many times with many people and have always found it to work well. Why don’t you give it a go, and let me know how you get on.